BELIZE CITY, Mon. Aug. 28, 2017–Since the late 1990’s, a number of Belizeans have been awarded scholarships to study medicine and become qualified doctors, courtesy of a scholarship program launched by the Cuban Government and its visionary revolutionary leader, the late Fidel Castro. Yesterday, Sunday, a contingent of 12 Belizean students who have been awarded scholarships to study medicine for six years in Cuba, left the country to embark on their studies. 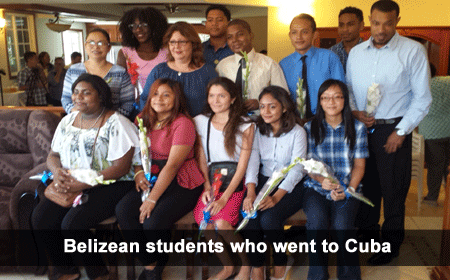 On Friday, the Cuban Embassy in Belize held a farewell reception for the twelve Belizean students. Deryck Satchwell, Deputy Director of the Tertiary and Post-Secondary Education Service, told 7News on Friday that there were 13 scholarships that were offered this year to Belize, but so far only 12 have been granted, so there is a spot for one more student. Ambassador Perez explained that the idea of the scholarships came after a hurricane affected Central America and the Caribbean in the late 90’s. The Belizean students will be attending the Latin American School of Medical Sciences Project (ELAM as its Spanish acronym), part of the Comprehensive Health Program (PIS as its Spanish acronym) through which Cuba extends medical assistance to several developing countries. It is an example of what a country poor in economic resources, but rich in human capital and with the political will can do to help others. Young people from Latin America, the Caribbean, Africa, Asia and the United States who are educated at the institution are expected to return to their communities to contribute to the sustainability of their health systems. ELAM has graduated more than 28,000 doctors from 103 countries, the Cuban Embassy said in its outline about the program. The current group of young scholars will study Medicine, Dentistry, and Health Technologies. Two of them, who have already graduated as doctors in the program, will be specializing in Pediatric and Internal Medicine. Students who are going to study medicine are: Hiram Abiff Gongora, Emile Hung, Chelsea Marie Lyons, Brianny Shantel Fowers, Brannie Edelmira Marin, Patrick Noah Pinkard, Tomas Andrew Coc, Clement Michael Chun, Ashanti Natasha Navarrete, and Jamilet Dariani Cob. Doctors who are going to study in specialized medical fields are Dr. Carmelita Deliah Moh and Dr. Ryan Gilbert Gentle.